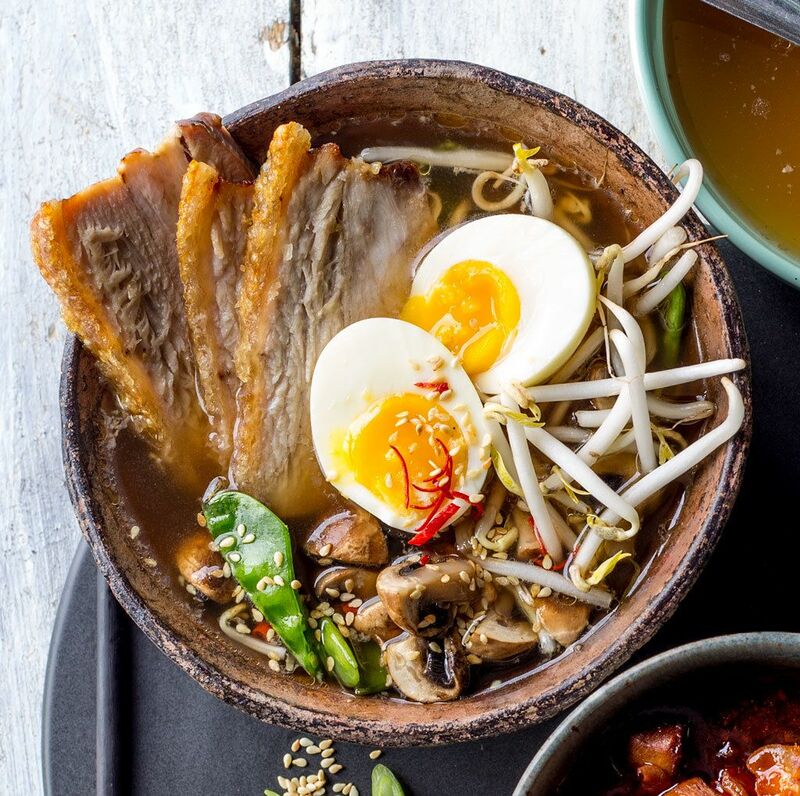 Ramen is a traditional Japanese dish that typically uses Chinese-style wheat noodles, but this recipe lacks the key ingredient, hence the name. For the pork marinade, combine the sesame oil, half of the soy sauce and half of the garlic in a mixing bowl. Add the pork steaks, mix them together and leave them to marinate for 20 minutes. Heat the coconut oil in a large saucepan over medium heat and add the ginger, five spice, chilli and remaining garlic, and cook for 2 minutes until they become aromatic. Now add the pork broth, water and remaining soy sauce and bring it to the boil. Once it begins to boil, reduce the heat and leave to simmer for 15 minutes. Meanwhile, get a griddle pan very hot and grill the pork steaks for 3 minutes on each side. Leave them to rest before cutting them into strips. Back to the broth, assuming 15 minutes have passed, add the mushrooms and mange tout and cook until tender. To serve, divide the bean sprouts among serving bowls. Place the sliced pork and egg on top of the sprouts, fill each bowl with the broth. Finish it off with a sprinkling of sesame seeds.